Not too long ago, augmented reality (and mixed reality) graphics were a feature reserved for the highest end of sports television productions boasting the biggest budgets. Now, with broadcasters and other content creators leveraging super-advanced gaming engines like Unreal Engine and Unity, this segment of the creative business is becoming more democratised. Those behind the scenes who implement technology and establish workflows within a content organisation today can more easily put these kinds of tools in the hands of their creative staffs and let them do their magic. This leads to a much more diverse and robust output of content, with more unique looks and styles for a variety of shows and live broadcasts. There’s more time and opportunity to do new new, different, and exciting things on-screen. A broadcaster like MLB Network, for example, offers more than 30 hours of programming per day across its various linear and digital platforms. Thanks to advances in technology, there’s less friction when something new is introduced into an organisation that, in many cases, has many established legacy workflows. 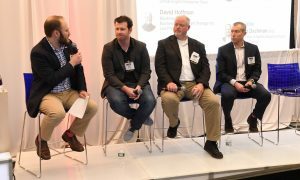 “It’s ROI: are we going to get something better, faster, cheaper that’s going to allow us more time for design and creative thought?” said Brian Perkins, director, IT production systems, MLB Network, during a panel discussion at the recent 2019 SVG Sports Graphics Forum in New York. “Are we experimenting? Minimally. Are we trying to figure out where to experiment? Yes. We have a larger, more entrenched workflow, so what we’re looking at is what is the next step and the next evolution for us, because, [as with] a lot of broadcasters, there is going to have to be a revolution: not all of our revenue is going to come from the same sources that it did. Since broadcasters are always looking to do more with less, virtual studios are increasingly favoured over traditional brick-and-mortar sets. That’s largely thanks to the accessibility of those real-time gaming engines like Unreal Engine. Once content creators realised that the same technology that is used to make videogames can be used for live broadcast, those creative rivers began flowing. The hardware side of the business is also pushing things forward by identifying and removing barriers to executing these kinds of workflow changes. For instance, Blackmagic Design’s Ultimatte 12 solution, a top-flight keyer and advanced real-time compositing processor, helps turn around next-gen broadcast graphics in a live environment. Such technology is blurring the lines between the Hollywood postproduction world and the live–sports-broadcasting business, making sports productions increasingly cinematic.